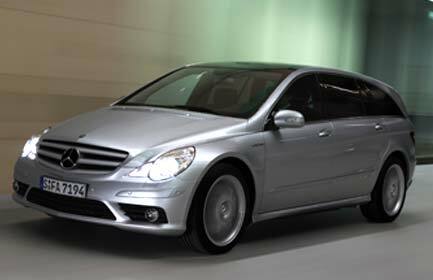 After considering good reviews of Mercedes-Benz R Class, we have decided to include it in our list of luxury SUVs. This ranking is based on analysis of various published reviews on different magazines and opinions of many test drivers. If you can afford the high price Mercedes-Benz R Class, then you will enjoy its spacious, luxurious interior and innovative styling like a wagon. It also comes with a fuel efficient diesel engine option. The unique looking Mercedes-Benz gives the impression of a minivan, but it is the most luxurious family SUV you would ever buy. The first model was introduced in 2006, and it resembles like M-Class SUV, but the exterior is like a minivan. It has the seating for six people, all wheel drive, and extra cargo space that you could ever imagine. It is the best alternative to a minivan. You can enjoy the power of an SUV and a perfect safe family vehicle. Mercedes-Benz styling is liked by many reviewers. It is the combination of minivan and SUV with excellent driving dynamics. The room for six persons is extremely comfortable unlike any other SUV. It is one of the most expensive SUV, but it is also one of the luxurious SUV in the market. The higher price tag may be the consideration for many people, but if you are looking for a family SUV, then it is the best option. Fuel economy ratings are also the worst in its class with 14 mpg in city and 19 mpg on highway, which is below average. The diesel model option has the exceptional fuel economy with 18 mpg in city and 24 mpg on highway. It is the best value for the buyers. If you are considering a high price tag, then this might not be the best choice. You can consider other less expensive SUVs. However, none of them match R Class unique styling and extra cargo space. The best alternative to R Class is Lincoln MKT, which provides seating for seven and has a much better fuel economy, and most of all it costs less than R Class. We have reviewd MKT in our previous posts. In new model R Class comes standard with 19 inch wheel and R350 BlueTEC engine, which produces extreme power. It has two trims the base model R350 and diesel powered R350 BlueTEC. Both the model comes with 4MATIC all-wheel drive system in Mercedes. The main advantage of wagon looking R class is that most of the test drivers are impressed by its sedan like smooth driving. It is the big plus for family SUV. However, the two drawbacks are the worst fuel economy and a high price tag. The base model comes with the R350 3.5 litre V6 engine, which produces 268 horsepower and R350 BlueTEC comes with 210 horsepower engine with turbo diesel. Both base model and turbo diesel model are based with seven speed automatic transmission. Test drivers are satisfied with the power, but they prefer the fuel efficient R350 BlueTEC diesel model. There is a difference of only $1,500 more than the base model. It is a fair deal for the best fuel economy. If you are looking for long-term saving, then fuel economy is not adequate. However, until you choose the diesel mode. Most of the reviewers find the R Class handling like a sedan, and they prefer it over other SUVs. Many critics applaud the Mercedes-Benz R Class for its roomy and luxurious interior, which is very distinct from other SUVs. Providing seating for seven people, it is a luxurious family minivan alternative. Mostly, reviewers are positive about the comfort and luxury of the seats. There is an optional middle seat in the second row, which provides seating for seven people. It is the first SUV, which have received positive reviews about rear rows. Leather upholstery and power driver are standard in R class. There is an option for memory seats and heated front seats. R Class has many basic features like, leather tilt, burl walnut wood trim, telescopic steering wheel, dual-zone automatic climate control, a six-disc CD changer, a rear air conditioning, a power sunroof and heating ducts. Reviewers like the soft touch materials. It comes with famous COMAND system, which controls the stereo system, navigation and Bluetooh. There are other optional features are also available. However, some of the reviewers find it complicated and outdated. The exterior styling is unique like a minivan and it is liked by many families. There are mixed reviews about the exterior. It is rated “Good” in front, side and rear crash protection tests. R class comes with plenty of advanced safety features that good SUV must be equipped with like four-wheel Electronic Traction System, Electronic Stability Program, driver and front passenger airbags with dual stage deployment, anti-lock brakes with Brake Assist, second row side airbags, and front and rear side head curtain airbags. There are other optional safety features as well. It is the safest car to drive and the reliable car to buy. We recommend giving it a try because most people are fond of its uniqueness and luxury.